KEAM Application Form 2019: Kerala Engineering Architecture Medical (KEAM) Exam is a state-level entrance exam conducted once a year for the candidates who want to take admission in the field of Engineering & Pharmacy. This exam is organized by Commissioner of Entrance Examination (CEE), Kerala. No entrance exam is conducted for medical and architecture course. On the basis of NEET score, candidates can get admission in the medical colleges and for architecture, students have to clear the National Aptitude Test in Architecture (NATA) exam. Through this exam, candidates will get an opportunity to take admission in various streams of engineering degree. CEE will release the CEE KEAM Application Form on its official site in the month of February. All interested candidates can apply for KEAM 2019. Here we have mentioned the details related to Kerala KEAM Application Form , eligibility criteria, last date of closing of form etc. Applicants must be citizen of India. 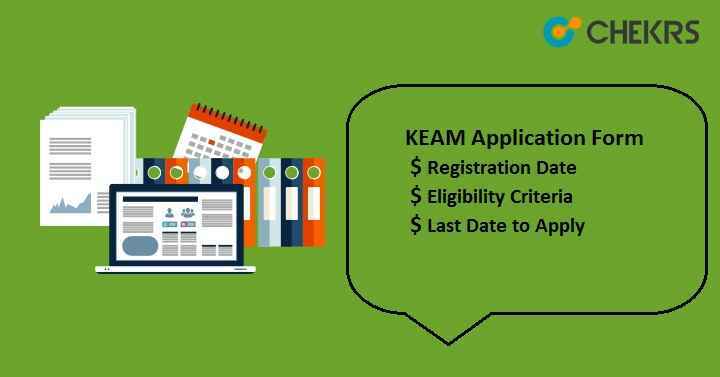 PIO or Overseas citizen of India can also apply for KEAM 2019. Minimum age of candidates should be 17 years as on 31.12.2019. For Medical course, candidate must appear and qualify NEET exam. For Architecture course, students have to qualify NATA exam. For Engineering, applicants must have scored 50% in class 12th in PCM subject together. For reserved category candidates, 5% relaxation will be there. Sign-up to the candidate portal with name, mail id, mobile no and set a password. After this, candidate will receive a message with generated application number on her/his mail id or mobile no. Login in to the account with the application no and password. After login, next step is to fill the application form with all required details. Keep all documents together while filling the application form. Candidate’s name & father’s name must be same as mentioned in 10th certificate. Fill the form carefully; mistake made in form can affect candidate’s eligibility for admission. No changes can be possible after form submission. Before final submission, click on “Save & Preview” button, to view the filled application form. Pay the fee through the 2 modes i.e. either online payment gateway or e-challan. Fee will different for reserved category. Application Fee will be non-refundable/ non-transferable. Take the print of Application form after filling it completely. Send Print of Application Form with relevant Document to the CEE. Paste the photo of size 3.5 x 4.5 cm same as uploaded photo on the form, duly attested by Head of Institution/ Gazetted Officer. Sent it to the given below address with the relevant documents. All candidates have to submit the application fee for the KEAM Entrance Exam except Schedules Tribes category. Candidates can pay the KEAM Entrance Fee through online mode or e-challan. For online method, pay the fee through payment gateway (Credit card/ Debit card/ Net Banking). Candidates can also pay the fee in any Head/ Sub Post Offices in Kerala in cash with generated e-challan from the website and receive the counterfoil of the e-challan from the post-office. After this, login to the website and check the payment status, if payment tab in the turns green, then post office official has updated the fee status. Othewise, candidate must contact to the post office immediately and get the payment status updated.